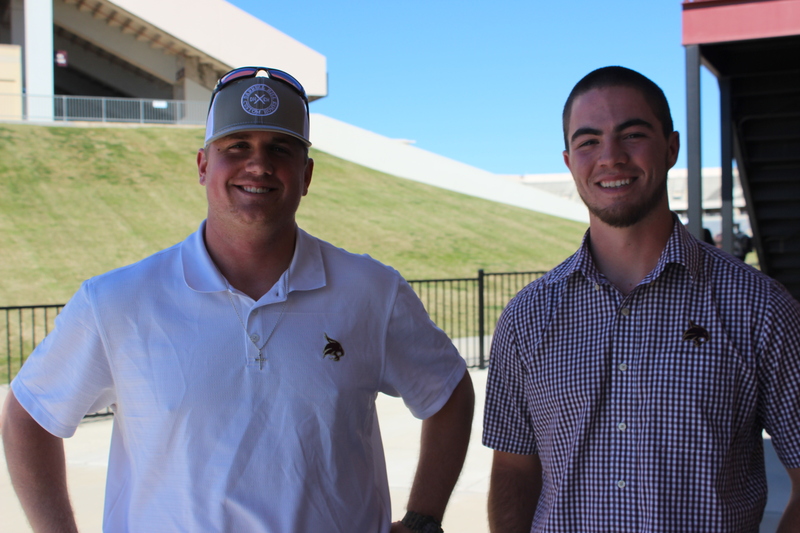 Tanner Hill (Left) Granger Studdard (Right). Photo by Chuy Perez. Granger Studdard, a junior outfielder from Buda Texas, looks to continue his success in his third season with Texas State Baseball. Last year, Studdard led the Bobcats in home runs, hits, triples, total bases and finished second on the team in batting average and doubles. Granger attributes his offensive success to all the hard work he has put in during his previous seasons at Texas State. He has established a workman’s attitude and a daily routine of getting to practice early to get extra batting practice. Coach Ty Harrington spoke very highly of Studdard’s dedication to the process and his ability to control his emotions during the game and not be phased by the big moment. Granger’s ability to keep composure in key moments of the game is one of the many things that make him such an important player for the Bobcats. Best known for his clutch hits at the end of games, Granger has accounted for 5 career walk-off hits and 3 career walk-off home runs. Studdard says he doesn’t have a formula for his success late in games, he just goes out there and tries to make good contact with the ball to put his team in the best position to win. Time after time, it always seems to be Granger stepping up to the plate with the game on the line. Studdard was recently named to the Sun Belt Preseason All-Conference First Team, after earning a Second Team All Sun Belt Conference selection last year. Studdard had 17 multiple-hit games and nine multiple-RBI games in conference play last year.